Pierate - Pie Reviews: TV's Radford Family keep pie-ducing the goods! TV's Radford Family keep pie-ducing the goods! 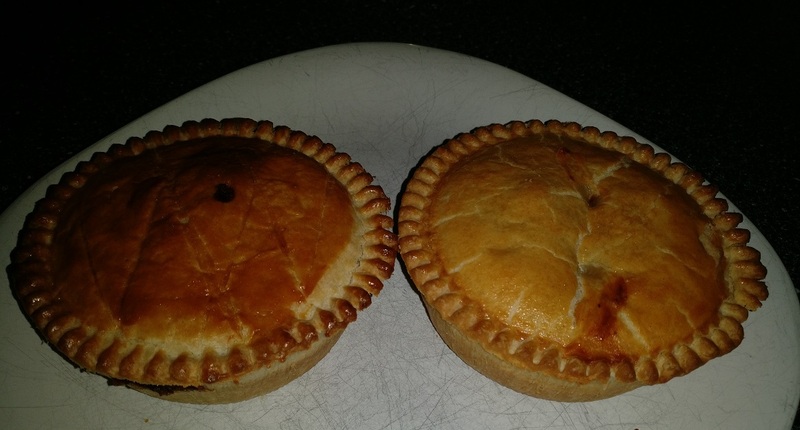 Having previously tried and highly rated their pies over 18 months ago, a trip up to Morecambe recently seemed like the pie-fect opportunity to rate some more of the pies from Radford’s Pie Company, based just outside Morecambe on the Heysham Road. We were up in the area for the Morecambe v Wycombe football match and contemplating a wander over to the stadium from the train station once we’d picked up some of their pies, but were very kindly offered a lift across by Noel Radford, potentially the busiest dad in the country! For those who don’t know, the Radford family featured on Channel 4’s 15, 16, 17, 18 and “19 kids and counting” and are – as you might have guessed – the largest family in the UK! Oh, and further congratulations are in order - they recently announced on Facebook they are expecting child number 20! With so many mouths to feed, it’s a good job the family run a pie company out of the local bakery they own! All the pies were once again made with shortcrust pastry, with a crisp lid and pastry sides that held the content in well. This was particularly evident when seeing how well filled the pies were, as the pies are crammed to capacity with meat! They are £3.05 for a 280g, which is pretty reasonable (though if you get the right deal online, you can get them a bit cheaper if you buy a box load or even get a 3 month pie subscription!) They come in the classic foil case with crimped top edges, familiar to a lot of (particularly Northern) pies. As you can see from the photos below, they cut well and didn’t collapse like a lot of pies can do. The cross-section really highlights the packed content and the golden lids to the pies. And as mentioned in our previous review, the local ingredients, from butchers and vegetable sellers near to the bakery, also adds to the appeal of these pies. Did you know?! Our first review of Radford's Pie Company 18 months ago is our second most viewed post and most viewed pie review - with over 5,700 views!! Large chunky pieces of steak and a nice cheesy flavour meant this pie delivered! The meat was very nice and packed out the pie content, with a very meaty 45% beef steak. The gravy was quite a nice thickness, making it quite moist to contrast with the quite crisp outer pastry and the stilton cheese was flavoursome without being over powering. Overall, my favourite of the Radford’s range that I’ve tried so far! Pierate Recommended. 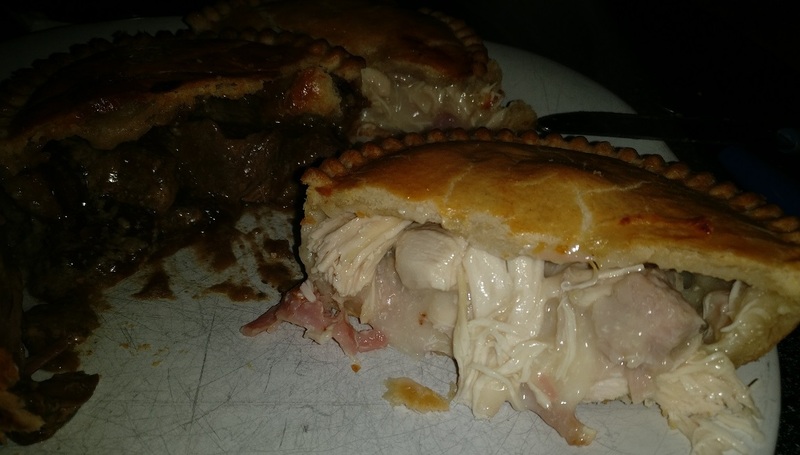 With this pie consisting of 38% chicken breast and 10% ham, this pie certainly wasn’t lacking in meat and eclipses the meat content in the chicken pie we rated last time! It was a very enjoyable pie, with my only suggestion that the pieces of ham and chicken were quite chunky and thus (specifically the ham) not quite as succulent as it could have been if perhaps in slightly more small pieces. However that said you could really taste the ham – unlike in some chicken and ham/gammon pies where just a token bit of ham is included – plus the sauce was good, adding a nice blend to the flavour. As can be seen from the photo above, the capacity is top notch and good content means this pie scores very well. Pierate Recommended! The chicken and mushroom pie contained 38% chicken breast, which packed out the pie quite well but wasn’t quite as meaty as the chicken and gammon pie I’d eaten the previous day. However it was a nice flavour in a creamy sauce, and the mushroom added a bit more texture to the straight chicken pie I had last time. While not quite as high scoring as the chicken and gammon, still a very good pie. All in all, some very good pies from Radford’s and it’s a luxury to find a fully family run business like this that uses ingredients from local producers in the area. It’s great that they do online delivery of such top pies and I’d certainly suggest you order a batch as they are worthy of Pierate Recommended status!